Two generations of Croxtons enjoy the bounty of a Tidewater oyster roast. Ryan Croxton and Travis Croxton founded Rappahannock Oyster Company, a resurrection of family business started over 125 years ago. The two-lane highway that delivers you into Topping, VA, from “the other side, as the locals say, brings you over a big bridge, so you know you’re somewhere near the water. But as you cruise past a few gas stations, a tiny airport, the Pilot Inn and take a left by Eckhard’s restaurant, you don’t necessarily know you have arrived anywhere special. That insight hits as you course down a windy rural road and suddenly you realize you’ve ended up at the Rappahannock River and a little slice of heaven called Merroir. An oyster roast in full swing. 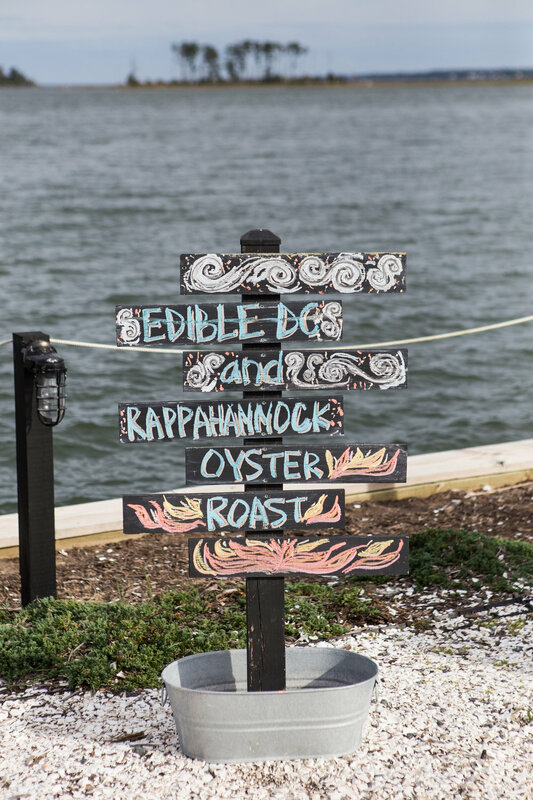 The Croxton cousins, Travis and Ryan, founded the riverside restaurant in 2011 after starting the Rappahannock oyster farm in 2001. As with all epic journeys, this one started with a unique opportunity, great timing, pluck and a lot of Googling. The tale has been oft told, but a recap: Grandpa Croxton had been an oysterman, but by 2000 oystering had declined to the point where it was almost irrecoverable commercially in Virginia. His boys, the elder Croxtons, were of the mind that it was probably time to stop paying the state license fees on the long-dormant beds held in the family name since the late 1800s. Flash forward 16 years to a stunning October afternoon on the porch at Merroir and a conversation with two men who have played a big role in the resurrection of the Virginia oyster and ultimately, given the water-filtering power of the oyster, to a cleaner bay. Rapphannock's oyster men start work before daybreak. Rappahanock Oyster Co. now harvests over 10 million oysters from over 60 producing beds and ship not only to their restaurants, but to hundreds of vendors on the East Coast, also shipping daily to Los Angeles and the West Coast, and internationally. Travis told me that Rappahannock oysters are sold across to Asia: Singapore, Hong Kong, across China and more. Dogged determination from the farm team, a great product and getting the logistics right for sending a highly perishable product up and down I-95 and around the world contributed greatly to the success of the company. And timing. The public’s growing interest in eating local, rather than imported, seafood has been huge. Which brings us back to the oyster roast, a fixture of southern gatherings. Ryan and Travis both agreed that, like picking crabs, shucking a roasted oyster is a communal activity and has become a tradition in mild Virginia and Maryland winters. Pouring out hot oysters on a table, then easily opening the softened shells with a knife is just something that lends itself to groups of friends. Travis explained that there just seems to be a community feel to eating shellfish and that back in the peak oyster days of the late 1800s the Chesapeake was lined with oyster saloons where shucking, beer and gossip drew neighbors in. Today’s roast features Rappahannock oysters fired up over wood briquettes, some clams, a bourbon punch and Autumn Cline’s amazing pozole. When I ask the Croxtons what they are most excited about, they answer in unison: “Autumn!” Executive Chef Autumn Cline joined the Rappahannock Oyster Company team in 2016 from from a stint at Rose’s Luxury. She currently oversees the kitchen and menu development at Rappahannock Oyster Bar in Union Kitchen and will also be in charge of the new location aiming to open at The Wharf in the spring of 2018. That restaurant will be in the middle of a fish market, a perfect situation for a cook who loves to experiment with local fish that aren’t common to menus: think black drum, puppy drum, sheepshead and migratory species. She also wants to try using new parts of fish in ways we typically don’t see (think salmon skin chicharrones) and weaving Latin flavors throughout the menu. So in addition to Chef Autumn and The Wharf, what else are the Croxton cousins looking forward to in the next year? “Two things: We’ve got our eye on raising scallops. They were extinct [locally] since 1933, and so we’re still learning because no one has commercially grown them for a long time. But, we’ve got eel grass in place and it’s growing like mad, which is good because that’s what scallops need for a habitat,” Travis said. First, invite some friends—say, a dozen—over for a late-afternoon roasting party on a sunny, blustery day. Set up traditional oyster roast tables by setting a long piece of wood (an old door? A plank of plywood?) over tall two garbage cans, high enough so that you can eat standing up. If you have time, have a handyperson cut a hole over each garbage can so you can easily throw the shells in there to recycle them. Or forget about the table and just use whatever you have outdoors; get a bin for recycling shells. The best part about an oyster roast is not overthinking it. Next, get seven or eight dozen oysters from the Chesapeake. Scrub them down a bit. Get a big piece of burlap, or heavy foil. If using burlap, soak it through and fold it so it is about the size of your grill. 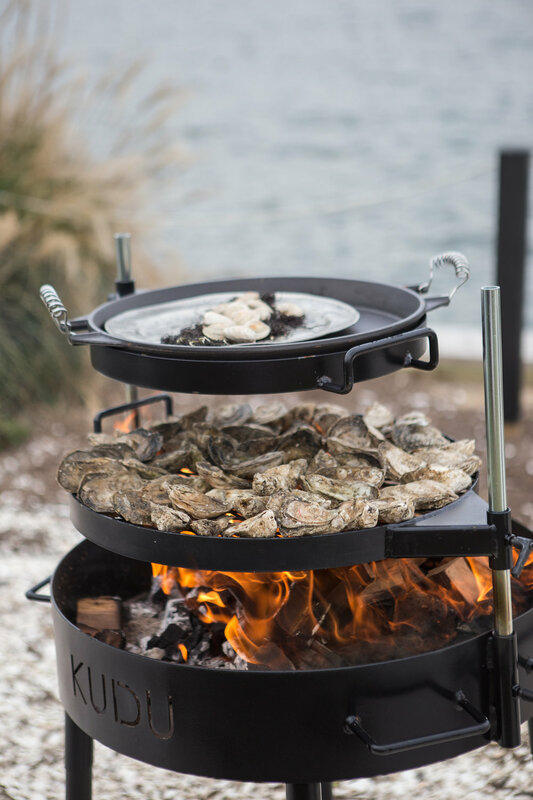 If using a charcoal grill, get the fire going, spread briquettes out, then do a batch of oysters at a time, covering with the wet burlap and grilling about 10 minutes, until they start to open and soften. Remove them from the grill with a pair of tongs and serve. You can also use a gas grill the same way, and if you are without a grill, you can still roast oysters in your oven. Roast them in batches on the bottom rack at 450°F with one cup of water in the pan, covered tightly with aluminum foil, for about 10 minutes. Feel like clams too? Get after it with about four dozen local clams. Scrub them and then steam them in pot filled with a bottle of beer for about 10 minutes over medium-high heat, covering the pot while steaming. Strain the liquid carefully as there might be sand and sediment, then serve the strained liquid on the side to dip the clams in to clean them if needed. Serve with the following: cocktail sauce, hot sauce with a little melted butter, mignonette if you like, saltines of course and more beer. I personally get very excited when pimento cheese shows up. Any good gathering during the holidays would also require a bourbon punch, but straight bourbon on some rocks would also be quite festive.